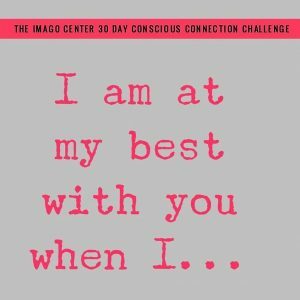 Back in September, I made a decision to start a practice of intentionally exploring my conscious connection to my husband. I was trying to walk the talk of what I tell my clients. I did this by starting each day with a prompt that gave me an opportunity to think about and then articulate or act on it in some way. Mostly for me, this meant that I drafted a post for my Instagram and then I wrote what came up for me in both the most intimate ways with my husband and in more generic ways that I thought might inspire others to consider their own relationships and perhaps connect with their partner! 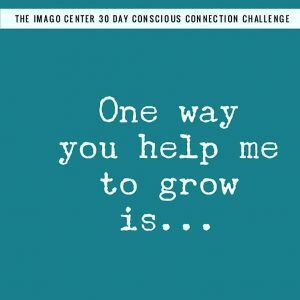 I have no idea if anyone took up my “challenge” to be “consciously connected” for 30 days. This idea has its roots in the Imago practice of “Zero Negativity.” Harville Hendrix and Helen LaKelly Hunt recommend that couples make a commitment to the practice of Zero Negativity by tracking their progress and being intentional about eliminating from their communication all shame, blame, and criticism of their partner. It is not WHAT you say, it is HOW you say it! John Gottman, of the Gottman Institute, posits that couples need a 5:1 ratio of positive interactions to negative interactions in order to have a merely stable relationship. He uses this ratio as a measure of predicting divorce in troubled couples coming to his clinic. Focusing on and cultivating positive interactions makes the negative ones less troublesome. The ratio does not suggest that there will be no negative interactions or that you can not express negative feelings or challenging issues. Both this practice and the Zero Negativity challenge invite us to be intentional about what we say. When I keep the focus on feeding the positive energy to support the connection between us, even during more trying interactions, we remain connected and feel safe in our relationship. In this way, I am able to feel my feelings without needing you to be the “cause” of my feelings. Feelings are autonomic and come and go. you do not “make” me feel the way I feel. Though, I may have feelings based on your behavior with or around me. A funny thing happened when I began to practice Conscious Connection. My husband and I have, in my opinion, a great relationship, and yet, when we began to connect across the ether in my daily Instagram to Facebook posts and reposts, things got very interesting. It happened that I started doing this practice at a moment in our lives when I had significant work demands that included extensive meetings, some travel, and some personal challenges in terms of my own professional growth. While he was looking at major family events, increased work-related travel and the usual, though nonetheless weighty, end-of-the-year work goals and targets to be met. It was a perfect storm for us to become focused on our professional lives and less connected to the sustaining relational foundation that we have built. Why Wouldn’t I Want To Do This! Things just got better and better for both of us. The work related insecurities and trivialities were completely manageable. We turned toward each other joyously, appreciatively, and happily. We let go of things that might have been a spark for a fight. We sought refuge in each other’s tenderness. He was at my side to be my most avid supporter and empathetic listener. I celebrated his successes and listened to his fears and worries. I felt seen and heard and was available to offer him the same experience. Life became the very thing we had been noticing in each other through the process of conscious connection. Our vision of us flourished! And suddenly the positive effect of was feeding the positive feelings which led to positive interactions. And the positive interactions led to more positive feelings. And all of a sudden we are acting as if we are newlyweds again! We can’t get enough of each other. At the end of 30 days–I thought: “Why would I stop doing this now?” Years ago a friend and mentor said to me “What were you doing when things were going well?” Invariably, I let my guard down when I think I do not need to be vigilant. I tell myself: “Things are good, I don’t have to do…anymore.” And yet things are good because of what I was doing. My words, actions, and thoughts actually DO have an impact on how I am and how others respond to me. So now, heading into December, we are still connecting consciously by letting each other know on a daily basis what we cherish about each other, how it feels when you do that thing that makes me laugh, why I love watching that show with you, and what it is about you that fills me up with hope and love and joy. And who doesn’t want more JOY in life!